Sources say Trump could both reprogram funds and declare a national emergency. When asked by ABC News if there is any wiggle room or plans to negotiate with the White House -- since the president made clear he wants to add to the deal -- McConnell did not rule that out but made clear he hopes the president signs the compromise already on the table. "They've reached an agreement, they now have to put it on paper, we have to see if that reflects the principles and we're hopeful the president will -- once he does that and once we do that -- will conclude that it's a good idea to sign it," he said. Sources tell ABC News that if Trump signs the deal, which provides $1.375 billion for physical barriers, he will likely also take executive action to reprogram billions in funds to reach the $5.7 billion he's been demanding for his border wall. Sources also aren't ruling out that Trump could declare a national emergency as well, and they indicate he could go well above the $5.7 billion in funding if he both reprograms funds and declares a national emergency. 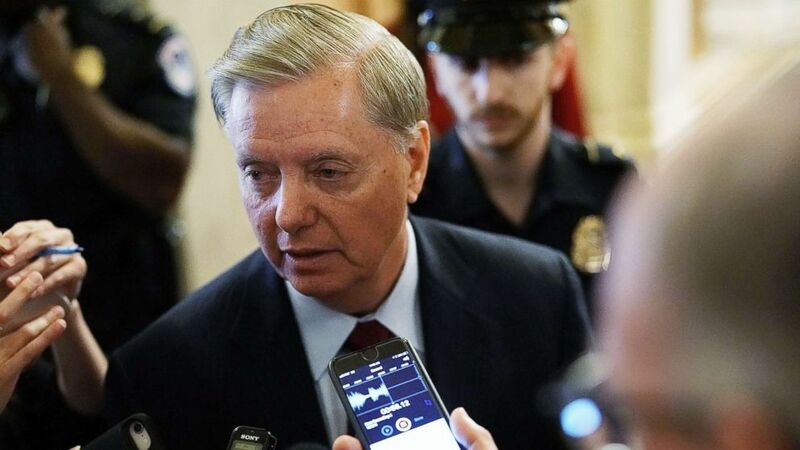 (Alex Wong/Getty Images) Sen. Lindsey Graham speaks to reporters at the U.S. Capitol, October 5, 2018, in Washington, D.C.
Republican Rep. Mark Meadows, who also has Trump's ear, told ABC News that "executive action to address the growing border crisis will now be required." Trump said Tuesday he's "not happy" with the deal announced by top congressional negotiators on Monday night. “I consider everything,” he said when asked specifically about a national emergency declaration. Sources involved in the negotiations have pointed to 10 U.S. Code 284 as a way to obtain funds for a wall. The statute says the Department of Defense may provide support for counter-drug activities to another agency. However, it’s unclear how much money the administration would be able to take from existing Defense Department funds or which account they could draw from. One U.S. official told ABC News Monday that the Pentagon is looking into how funds from the military construction budget could be reprogrammed, but other accounts could be under consideration as well. Lawyers at the White House, at the Department of Homeland Security and at the Pentagon have for weeks been ironing out the different options the president would have to obtain funds. Sources caution that a way forward is not yet locked in and nothing has been finalized. “I think he's saying from my point of view, this is a national emergency and I think he's willing to have that fight with Congress and the courts,” he said. Democrats, not surprisingly, think it's a bad idea. Rep. Pete Aguilar of California, one of 17 bipartisan negotiators who crafted the border security funding deal, says Democrats will pursue "every possible remedy" if Trump takes executive action to reprogram millions of federal dollars to build border barriers without Congress' approval. "The reaction should be swift and it should be a bipartisan rebuke of what the president is contemplating," Aguilar said on ABC News Live's "The Briefing Room." "Every Republican should be upset if they start taking disaster money and money that is programmed for our districts and shifting it for something that Congress has not authorized. That is executive overreach. I just – I can’t imagine what Republicans would do if President Obama had done this." “If the president illegally seizes power to reallocate money, he is violating the constitution, his oath of office, and the Congress should act accordingly,” Democratic Sen. Richard Blumenthal said.